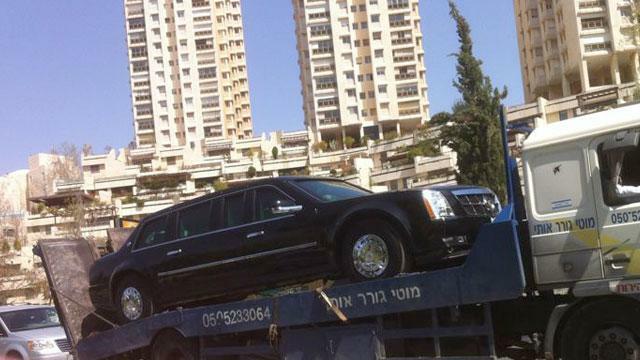 A limo shipped from Washington, D.C. to taxi President Obama around Israel failed and had to be towed in Jerusalem. The president hadn't yet arrived in the country when the malfunction occurred. He arrived in Tel Aviv Tuesday. "One of our vehicles is experiencing mechanical problems. This is why we bring multiple vehicles and a mechanic on trips," according to a Secret Service spokesman, Agent Edwin Donovan. The Secret Service ships a number of limos for each presidential trip. CNN reported the limo suffered a case of auto indigestion because a driver filled it up with gasoline instead of diesel. But the Secret Service would not discuss the nature of the break-down. Obama is clearly pleased with the opportunity to get outside the beltway. Upon landing in Tel Aviv he joked to Israeli Prime Minister Benjamin Netanyahu it was "good to get away from Congress." Earlier in the week he told an Israeli TV station he sometimes fantasizes about putting on a fake mustache and hanging out at a café in Tel Aviv. But the trip won't be quite so relaxing. Obama and Netanyahu have a busy day planned and will take part in a press conference later Wednesday before a working dinner.